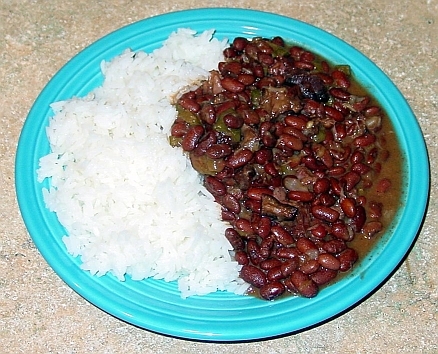 Red Beans and Rice is a dish that is usually considered to be Creole, not Cajun. I just think it's good. This is my own recipe, and you may wish to modify it to suit your tastes. I like the beans to be flavorful, and quite spicy, so you can mix them with the rice and still get plenty of flavor and a little heat. I also have a recipe for Cuban Black Beans and Rice, which you might want to try. Real Red beans are not kidney beans but are a smaller bean. They are quite common in the Hispanic section of grocery stores. This type of red bean is probably the more authentic bean to use in this dish, but I'm not necessarily trying to make an authentic dish, just one that tastes good. I generally use dark red kidney beans, which makes the dish a little different, but I like it better with kidney beans. Occasionally I will use black beans, which are quite good too, and change the character of the dish a bit. You first need to sort and rinse the beans to make sure there are no bean sized pebbles or mud in amongst the beans. Then put the beans in a large pot that will hold at least 3 times the volume of the dry beans. Cover the beans well with water and bring to a boil. Turn the heat down to a simmer and allow the beans to simmer for 3 to 5 minutes. Turn off the heat, cover the pot, and let the beans set and soak over night (12 hours or more). If you are including the ham hocks, then pick a large pot, cover the ham hocks with water, bring to a boil and let them simmer until the bones and meat come apart easily, this may take quite some time, so add more water as necessary to keep the ham hocks covered. Sometimes I start mine simmering (on low) before I go to bed, and let the ham hocks cook over night while the beans are soaking. Keeping the liquid in the pot, remove and reserve all the solids, and allow them to cool. If you are using the ham hocks, then combine the beans and bean liquid with the ham hock liquid. If necessary, add water to cover the beans. Bring to a boil, and simmer for one hour. To make this a spicier dish, hotter, when you mince the jalapeños, include the seeds and pithy white flesh inside. To make it less spicy, cut the peppers in half, then scrape out the seeds and pithy white flesh and rinse the pepper halves before mincing. While the beans are simmering, sauté the onion, bell pepper, jalapeño peppers, and celery in the bacon grease or olive oil until the onion is transparent and all other vegetables are soft. In Creole cooking this combination of onion, green bell pepper, and celery is often used, and is called the "Holy Trinity". If using the ham hocks, when they have cooled, separate the meat from the fat, bones and skin or rind. Return the meat to the pot with the beans, discarding the fat, skin, and bones. Okay, I have a confession to make: When I make this dish for myself, I chop up the fat and skin and return them, along with the meat, to the pot. I like it better that way. After the beans have simmered for an hour, add the onion-pepper-celery mixture, and all the remaining ingredients, spices and bouillon cubes, to the beans. Simmer this mixture for about three hours, adding water if necessary, so that the mixture never dries out. You do want the mixture to cook down and thicken somewhat, so it has a fairly thick consistency, but don't let it burn on the bottom, stir it occasionally. You also want the mixture to get creamy and smooth, which happens after some of the beans start to break up and their starch cooks into the liquid, so it may need to cook longer, perhaps an additional three hours, depending on what kind of beans you are using. In general, the longer it cooks, the smoother it gets. These beans can be served as a side dish to go with other foods, like ribs, or they can be used as a main dish. When using as a main dish, serve the beans beside an equal portion of a nice white long-grain rice. I like to use Jasmine rice because it cooks up to be a nice bright white color and has a flavor that goes well with the beans.